April 2nd is National Peanut Butter & Jelly Day. You can have PB&J oatmeal, a PB&J-stuffed omelet or PB&J-topped waffles for breakfast,. For lunch, a PB&J sandwich for lunch, and PB cake or ice cream with a jelly/preserves topping for dessert. For snacking, make this PB&J fudge in just 8 minutes, plus 4 hours in the fridge. 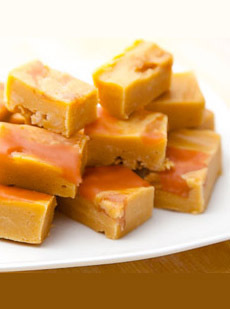 Peanut butter fudge is super-simple to make, but adding jelly makes it more fun, not to mention a perfect way to celebrate National Peanut Butter & Jelly Day. Made with just peanut butter, jelly, confectioners’ sugar, butter and white chocolate, this rich, yummy fudge is a pantry-ready dessert that can be whipped up in minutes, although it needs 4 hours to set. The recipe is from ILovePeanutButter.com, the website of Peanut Butter & Co. It was developed by Caroline Wright of TheWrightRecipes.com. She used Peanut Butter & Co.’s Smooth Operator creamy PB. Prep time is 3 minutes, cook time is 5 minutes, plus 4 hours chilling to set. Can you resist PB&J Fudge? Photo courtesy Caroline Wright and ILovePeanutButter.com. 1. COMBINE the peanut butter and butter in a medium saucepan. Heat over medium until melted; stir in the confectioners’ sugar and salt until combined. 2. POUR into an 8-inch square pan lined with parchment. Stir together the jam and melted chocolate, place dollops atop the fudge and use a knife to swirl the mixtures until marbled. If you’re not certain how to make a swirl, here’s a video of the recipe. 3. REFRIGERATE until chilled and firm, about 4 hours. Cut into pieces. You can store fudge in the refrigerator for up to 1 week.